Minnesota Softball organizes softball for the majority of community softball programs in the Twin Cities metro area (they do more than just the Twin Cities, but we're only concerned about what affects Eden Prairie). Through this network, community softball programs will have a central hub to form a league; and within that league, participating softball programs can split into skill levels (A, B, C) and form divisions based on proximity. Minnesota Softball serves as a central hub for tracking games and will post standings for the regular season. During the spring/summer softball season, Eden Prairie Fastpitch Association will participate in the Big West League. The Big West League typically consist of metro area softball programs west of 35W; community softball programs located east of 35W typically belong to the Tri-County League. Big West organizes the summer regular season games and the end-of-season State Qualifier Tournament (end of June). Teams who win a game during the Big West League State Qualifier will be eligible to play in the Minnesota Softball State Tournament (beginning of July). Mid-season tournament wins only qualify teams for the NAFA National Tournament (mid- to late July) and do not earn you a berth in the Minnesota Softball State Tournament. Home teams are responsible for entering scores within 36 hours. This enables the commissioners to organize brackets for State Qualifier or regular season play during Fall Ball . If you already have a SportNGIN account, please forward your Username to the EPFP Commissioners as soon as you are appointed to a team, so they can forward this information to the Minnesota Softball commissioners to associate your Username to your respective EP team. If you need to create a new SportNGIN account, please use this (link) and forward your Username to the EPFP Commisisoners. Once logged in, the "Coaches Corner" webpage (link) which contains an FAQ of links to tutorial webpages, instructing coaches how to use the Minnesota Softball website. Spring/Summer softball - Soon after head coaches are selected for teams, they are required to attend the annual Big West Coaches Meeting. There, they discuss rules and gameplay, but most importantly this is the meeting where divisions are formed. Coaches separate into groups by skill level (A, B and C) and then most clubs gravitate towards other clubs near their vicinity, as these will be your potential travel locations gor games. Based on which clubs form a division, a regular season game schedule will be generated and submitted to the Big West League; the clubs that form your division are your regular season game opponents. Minnesota Softball Commissioners will enter the preliminary schedule into your team page on the Minnesota Softball website. Afterwards, it is up to the coaches to maintain their schedule. Fall Ball softball - Fall Ball softball is organized quickly, as some summer teams are still competing into late July, with Fall Ball starting in early August. Instead of having coaches meet to create a season schedule, Minnesota Softball devises the schedule. When registering teams for Fall Ball, commissioners of community softball programs provided a skill level "rating" (1-10) to their teams. Minnesota Softball uses this initial rating to determine the first week's opponents to match teams of similar skill. After the first set of games are played, Minnesota Softball will re-seed all teams based on their previous week's game results and determine new opponents for the next week, to provide an even parity for competition (so 4-0 teams don't play against 0-4 teams). Minnesota Softball posts the game assignments on their website, coaches must enter their games into their team schedule on the Minnesota Softball website. Use this link to go to the home page of the Minnesota Softball website. Log in and look for your ID at the top of the webpage. 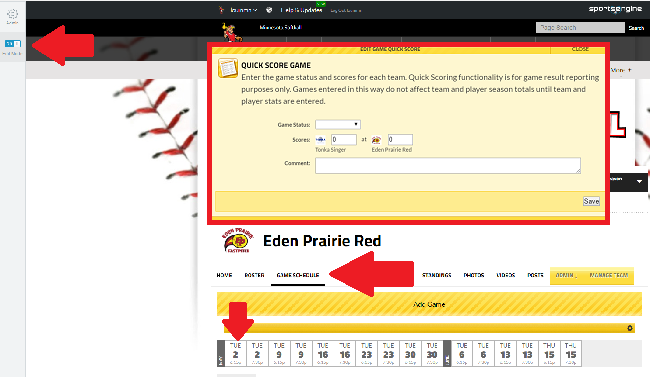 Enter "Eden Prairie" in the textbox on the upper right, then press the [Enter] key or click on [Search]. Alternately, you can find your team by using your mouse to hover over the Leagues tab-> Big West and finding your Age Group and Skill Level. REMINDER: The schedule on the MN Softball website is your official schedule regarding regular season game dates, times and locations; when you and your opponent head coach make decisions to edit details about a game (ie- date change), the game info is changed on the MN Softball website first. 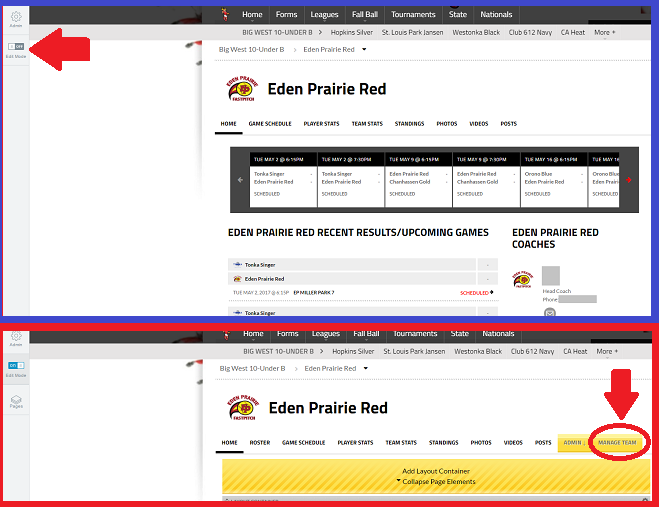 The schedule on your team page of the epfastpitch website should be a reflection of the schedule on the MN Softball website; the events on the schedule of the epfastpitch website serve only to generate reminder notifications to the families of your team for that event. Once the regular season schedule has been created at the Annual Coaches Meeting, the basic versions are inserted into the Minnesota Softball database as the "official master schedule". As we all know, changes to the official schedule can happen for a number of reasons (conflict, field availability, weather, etc) so it is important to know how to edit game data on their website. Log into the Minnesota Softball website and navigate to your team page. On the left side of your browser there is an [Edit Mode] toggle. Click to turn this on to make changes to the Minnesota Softball "official schedule" (event info); press [Manage Team] to continue to a new webpage. On the new webpage, select [Schedule] on the left side. Fall Ball coaches - use the [New Game] button to insert your game assignment into your team schedule. A game must be created in order for someone to be able to enter a score for it. Do not rely on opponent coaches to enter game info into your Minnesota Softball team schedule (if game info is found in your team schedule that you didn't insert yourself, it is because the opponent head coach created the game and listed you as their opponent). ​Each week's game assignments are posted to the main page of the Age Division in the Fall Ball tab on the Minnesota Softball website (ie- fastpitch.mnsoftball.com-> Fall Ball-> 10-Under). Game assignments get posted as early as WED morning, but game assignments are subject to change until as late as FRI evening. It is important to recheck your game assignments several hours before your game and adjust your team schedule on both the Minnesota Softball website as well as the EP Fastpitch website. ​Change it in the Minnesota Softball website so it's in your schedule correctly. Change it in the EP Fastpitch website to notify your families of the new changes (new time, new location, new opponent, etc). Summer softball coaches - Game info inserted by Minnesota Softball after the Head Coaches Meeting is generic info only. The main purpose for editing game info in your schedule is to insert the field location. At the beginning of the season, EP coaches submit their season schedule to the Field Coordinator to request fields for practices and home games. 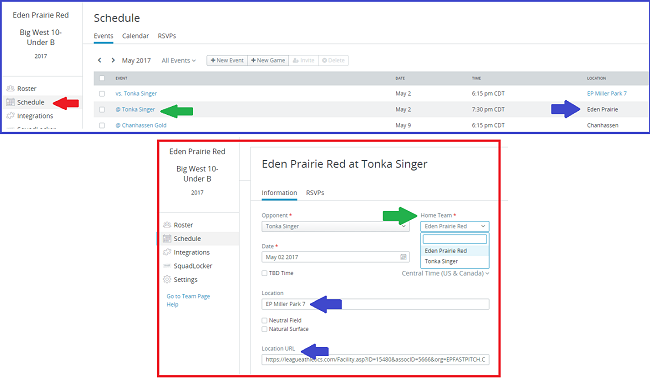 Once the home game fields are determined, coaches return to the Minnesota Softball website and edit the game by clicking on the link of the game (green arrow in the blue highlighted box). As of 2017, double-headers are played, but teams alternate as the "home team" for the second game, regardless of the location the game is played (home team shown by the green arrow in the red highlighted box). The blue arrows shows you where you can type the field name and field number. The Location URL you can grab from the epfastpitch website and insert it into this textbox (all this does is adds a link to the field location, instead of just the name; the URL step is optional). If you have to reschedule a game, change the date too. When you have home game details inserted into Minnesota Softball's website, it is our hope that the opposing coach will check their schedule on the Minnesota Softball's website to see what field you are playing on, instead of contacting you to ask where the game is being played. Log into the Minnesota Softball website and navigate to your team page. On the left side of your browser there is an [Edit Mode] toggle. Click to turn this on in order to enter the official game results to Minnesota Softball. Home team head coaches are expected to enter official game results into the Minnesota Softball website within 24 hours after games. Repeat Step 2 for Game 2. If you've ever gone into the Minnesota Softball website to enter scores of your home games (or checked the standings) and felt a little envious that other teams have logos next to their names, well here's one you can use! Right click the image and [Save Image As...] to download into your PC (remember the location where you saved it). Click [Edit Team] and then [Choose File] under "Logo to Upload" and select the file you saved in the first step.